Dr. Hiroshi Fushimi of Fukuyama University, Japan (2nd to the left), the symposium’s keynote speaker with SEAFDEC Secretary General Dr. Chumnarn Pongsri (2nd to the right); AQD Chief Dr Felix Ayson (leftmost); and Mr. Budi Iskandar Prisantoso, Chief of Inland Fishery Resources Development and Management Department (rightmost). SEAFDEC Training Department (TD) and Aquaculture Department (AQD) jointly organized the “Symposium on Strategy for Fisheries Resource Enhancement in the Southeast Asian Region” held last 27-30 July 2015 in Pattaya, Thailand. 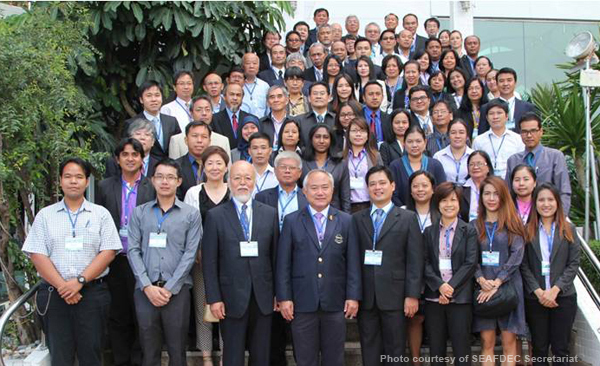 The symposium was convened to provide a forum for SEAFDEC Member Countries in sharing their experiences of good practices for enhancement of fisheries resources and formulating recommendations for implementation in the Southeast Asian region. Through the financial support of the Government of Japan (Japanese Trust Fund), the symposium brought together experts on resource enhancement, representatives from SEAFDEC member countries and regional/international organizations. The fishery resource enhancement activities discussed in the symposium focused on two themes: (1) Habitat Improvement and Management that includes establishment of fisheries refugia, habitat rehabilitation and deployment of artificial reefs; and (2) Artificial Propagation and Stock Release. AQD coordinated the organization and conduct of Theme 2 of the symposium.This theme, which comprised the sessions on (i) Stock enhancement and restocking; (ii) Release strategies and ecological interaction with natural stocks; and (iii) Aquaculture-based enhancement and restoration, was facilitated by AQD Chief Dr. Felix Ayson; Deputy Chief Dr. Takuro Shibuno; and Research Division Head Dr. Evelyn Grace de Jesus-Ayson. AQD scientists Dr. Ma. Junemie Lebata-Ramos, Dr. Nerissa Salayo and Dr. Jon Altamirano shared their knowledge, experiences and talked about AQD’s on-going research projects on resource enhancement. Plenary discussion of the issues under Theme 2 was chaired by AQD Chief, Dr. Felix Ayson. The symposium has identified and adopted the policy recommendations and strategic plans of action for implementation of fisheries resources enhancement activities in the Southeast Asian region. AQD team (left to right – Dr. J. Lebata-Ramos, Dr. E.G de Jesus-Ayson, Dr. F.G. Ayson, Dr. T. Shibuno, Dr. N.D. Salayo, Ms. B. Acosta, and Dr. J. Altamirano) during the field trip of participants to blue-swimming crab farm in Pattaya.